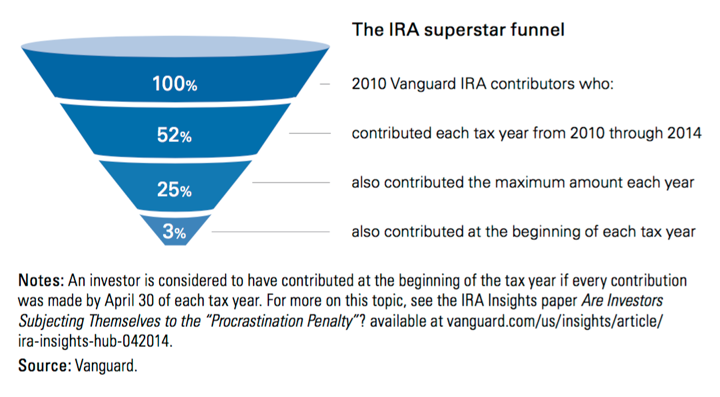 IRA Contribution Stats: Are You a Non-Procrastinating, Consistent Maximizer Unicorn? Besides being the tax return deadline, Monday April 18th, 2016 is also the last day to make a contribution to a Traditional or Roth IRA for the 2015 Tax Year. For both the 2015 and 2016 Tax Years, the maximum annual contribution limits are $5,500 (if under age 50) and $6,500 (if over age 50). 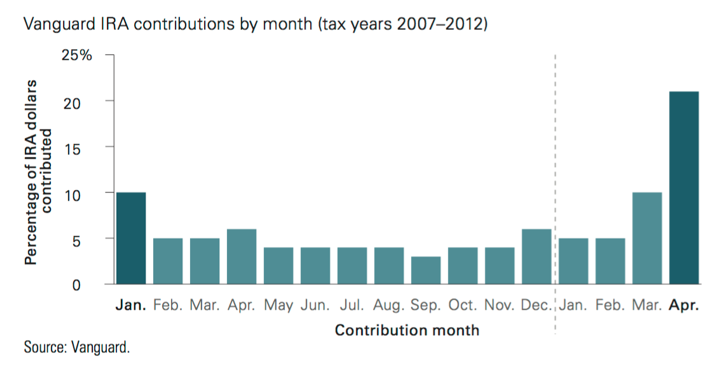 Out of Vanguard IRA contributors in 2010, roughly half continued to contribute every year for 5 years (2010-2014). Out of those 5-year “consistent” contributors, roughly half contributed the maximum allowable amount every year. Out of those 5-year “consistent maximizer” contributors, only 1 out of 10 contributed early on in the year, every year (by April 30th). I’ve been following this blog for a while. In the past you’ve shared detailed information about your finances. I won’t divulge any specifics, but given your financial history, it seems that you have well surpassed the income limit for contribution on a Roth IRA. Would contributing $0 to your Roth IRA be considered maximizing it if you reach the income limit? The last paragraph is my situation. Several years back, due to a job change my income changed enough that I couldn’t contribute to a traditional IRA and have it be tax deductible. Unfortunately I had already contributed and locked the funds into a good paying CD. I had to decide to deal with filing and keeping track of FORM 8606 or break the CD and re-characterize. Once the CD matured, I was able to move some of the IRA money to my 401k and then did a Roth conversion with the non deductible portion to clear out the 8606 and make tracking easier. Since then, I make my IRA contribution in March, for the previous tax year. Like anything with the market, sometimes I loose (maybe the market is up over the last year) and sometimes I win (the market is down over the last year). But I never worry about having to re-characterize an IRA contribution or tracking non-deductible contributions on Form 8606. I had a few years that I took off as the budget had other demands. Can still be a problem. I now tend to bunch my contributions, like I did this year where I did 2015 and 2016 all at once in April. I understand the “time in the market” idea that they are getting at, but I don’t need to chase the gold star in this case. Fund when I can, try not to let a year of eligibility pass by (unless something else is more important). I prefer not to wait and do it all at once early on, but I fall into the category of “not knowing how much my business will make this year” and thus wait until it’s all settled and taxes paid to make sure we have enough since our family of 4 now all relies on me. A person who blogs for a living – hah. Nice to know I’m surrounded by other procrastinating, consistent maximizers! Timely article. I am forced into procrastination b/c I do not know at the beginning of the year how much, if any, I can contribute to deductible IRA. Once I maximize that I contribute the remaining to Roth IRA. I know we can do, recharacterization, but I find it difficult. Our tax system is convoluted (it’s an understatement to say the least). It’s more likely that if you buy it all in January it will be higher at the end of the year, and indeed when you retire. On average the stock market goes up over time, so if you have the money sitting in cash you are better-off putting it in the account (and the market) all upfront. Unless your near retirement (say 5-10 years at most) dollar cost averaging isn’t going to make much of a difference. Compounding over years far outweighs any affects of cost averaging. You want to give yourself as much of a compounding head start as possible. If it helps you are still dollar cost averaging, just yearly instead of monthly. I understand that putting the money in early is best on average. But psychologically dollar cost averaging is great for me. Market drops are opportunities to get a bargain. i just don’t worry about where the market goes when I have a steady flow into the market all year. If that works for you then by all means you should continue. Apparently I am one of the 3%! I had no idea it was such a rarity. Even though my contribution pattern looks a lot like the one depicted, I have to say that I use my tax return to fund my Roth…. Does that make me a procrastinator or just resourceful? What I am challenged by is disciplining myself to reduce my pretax 403b contribution and to increase my post-tax Roth. I know it’s all about the “marshmallow” (delayed gratification)…. confession: I don’t think I have ever maxed out my Roth. This my first year maximizing my contributions early in the year. I used to just make regular contributions with each paycheck from Jan-Dec. Now I’m on track to max out both my wife’s and my account by July. I’m also trying to max out my TSP by August. 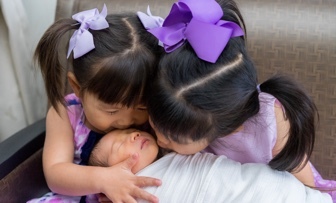 We also recharacterized our 2015 Roth contributions to Traditional to save $2000 on our taxes. Still not confident I did that right but no letters yet from the IRS! I guess I’m in the 3% as well. I keep track of my financials in a spreadsheet, and have a notation to myself about income limits, which do not affect me right now. Luckily they keep adjusting it higher, but if it does affect me someday, I have a couple of plan B options that I can possibly pursue. I only wish I would have started my IRA earlier in life. To be frank, when I first started following this website some years ago, is when I got my own financial house in order. It really opened my eyes. There is income limit (AGI) that someone cannot contribute to IRA. For a double income couple in Silicon Valley, is it reached pretty easily? For a Traditional IRA, the income limit only applies to the deductibility of the contribution. Anyone can still contribute to the max. Now, combine this with the fact that Traditional IRA to Roth IRA conversions do not currently have an income limit. There are some caveats, but run a search for the term “Backdoor Roth IRA”.